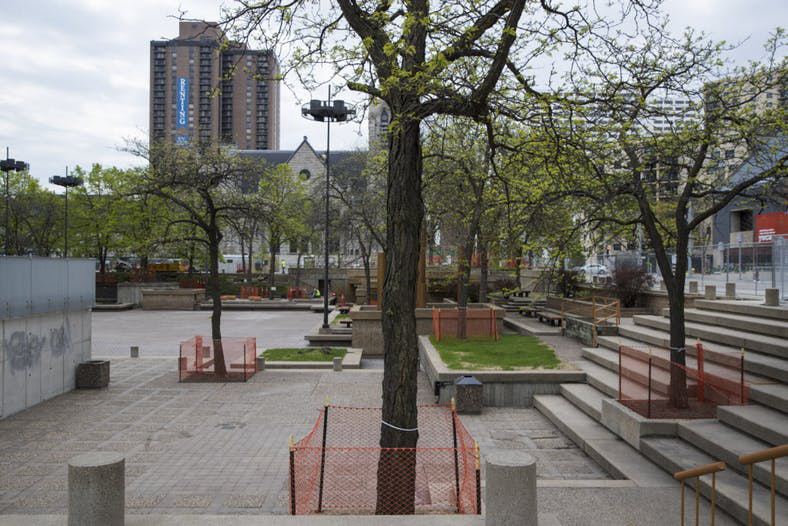 Work began Monday on a $10 million renovation of Peavey Plaza, the sunken park next to Orchestra Hall and across the street from Brit’s Pub on Nicollet Mall. Once a below-ground oasis of water and shade in downtown Minneapolis and home to the Minnesota Orchestra’s popular Sommerfest, the aging park has been in limbo for years. The cylindrical fountains were shut off after falling into disrepair, and the pond at the center of the park became a floor of dry tiles. But the city now has the money to rebuild the park, thanks to a $2 million grant from the state and $4 million in private donations, and it will be renovated and reopened in just over a year, Council Member Lisa Goodman and Mayor Jacob Frey said Monday. Goodman said the city’s commitment to parks downtown has not kept pace with private investment in the area. Designed by landscape architect M. Paul Friedberg and built in 1974, the plaza is marked by terraces and steps leading down to a pool fed by a large stainless steel fountain. The park was added to the National Register of Historic Places in 2012. Since the park has no ramps for wheelchairs, accessibility was a sticking point in a battle between historic preservationists and the City Council, which initially wanted to demolish the plaza and fill it in to adapt it for people with disabilities. The Preservation Alliance of Minnesota and the Cultural Landscape Foundation sued the city over the plans, and in a 2013 settlement, the council gave up the idea of filling in the plaza. The new plans call for ramps leading from the sidewalk on Nicollet to the bottom of the park. The terraces will remain. The architect of the renovation, Coen+Partners, aims to restore the park’s green canopy by planting trees; the fountains will return with better built-in water conservation, and the new water feature at the center of the plaza will be a quarter-inch deep — essentially a high-end splash pad. In addition to the state grant and the private donations, the city will spend $4 million on the project. The private money was raised by the Minneapolis Downtown Council and Green Minneapolis, a downtown park booster group. “Peavey Plaza will be a reinvigorated and vibrant space in the heart of the city,” said Frey, speaking at a lectern as two construction workers in neon vests worked on a retaining wall across the plaza. The park is now fenced off.